The platform economy is a modality of economic production mediated by a digital platform. It is growing exponentially, and has become a top priority for governments around the globe for the disrupting impact it is creating in cities, as well as for the opportunities it is opening up for the scalability of more sustainable and democratic economic models. The book provides an overview of current policy reactions and public innovations by cities in the field; a quality balance of platforms, which allows to differentiate models; and, a focus on Barcelona as a reference model for its vibrant sharing ecosystem and its innovative policies. This book is published on the occasion of the Sharing Cities Summit 2018. 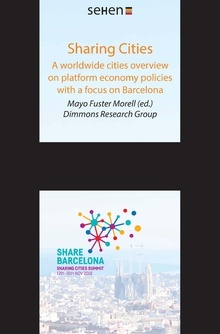 The third edition of the Sharing Cities Summit took place in Barcelona 12-15 of November 2018, after editions in NYC and Amsterdam. The event gathers Mayors and Deputy Mayors from leading cities from around the world, and actors of the sharing ecosystem, to discuss how the continuous growth of sharing economies impacts the life and economic development of the cities, and stimulate concrete collaboration between cities.